This year I tried starting my plants from seed. I've done that a bit in the past, but only with the really easy stuff- like string beans. I don't know why I thought it would be so difficult- surprise! It's not hard to do, for most of the plants I've tried so far. 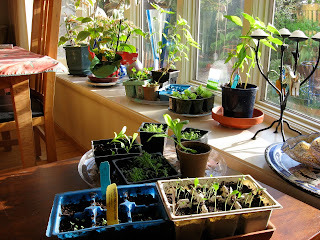 I have spent a lot of money buying seedlings in my lifetime so I thought it would be smart to save some money, plus I love growing things: I find it very satisfying and extremely addicting. Even though I live in the San Francisco Bay Area where the winters are pretty mild, we still get night temperatures into the 30's and maybe 20's, with frost. So that means even though we have a very long growing season and an early spring, most edibles are best started indoors if the night time temperatures are not reliably into the 50's (I just learned this). Since I don't have a green house or cold frame (do we really need these in our area you might ask? ), I tried it out in the bay window of our dining room. As you can see in the picture, this is not very many plants, but it's a start- I ran out of room quickly! I used potting mix and an assortment of left over six-pack and other small containers saved from my purchases. The real secret to success is to keep the starts moist, and don't let them dry out (Renee's Garden web site has some tips with photos). I started two kinds of sunflowers in February (too early I think), and these can be transferred outside soon. "Lemon Queen" is one I loved last year. It is a multi-branching type that gets lots of flowers about 5 to 6 inches across. They have pollen, so the bees love them too, in fact it is a highly recommended plant for attracting bees to the garden by the Great Sunflower Project (this is a volunteer participatory effort to gather data on bees). It makes a stunning addition to the summer garden. I'm trying "Chocolate Cherry" also, which has maroon flowers of the same multi-branching type, but sadly, no pollen. I've also started some Roman chamomile, the herbal kind, not the ornamental ground cover. I bought a small plant last fall and I love the wonderful apple-like scent of the foliage, and it produces a profusion of flowers to harvest for tea. The seeds sprouted easily indoors in plain potting mix. I recently bought some seed packets at my favorite garden supply store, Common Ground. The seeds are from Renee's Garden. She has wonderful special varieties of flowers, herbs and vegetables, so I bought a bunch. This is Renee Shepherd, who also writes articles for gardening magazines and has a great web site. I was so inspired by her article on growing zinnias that I bought some of her zinnia varieties, and the couple I tried so far (Persian Carpet and Apricot Blush) have started just fine. She also notes how to collect and store the seeds for the next season's planting. The article is in a special edition magazine Starting from Seed published by Fine Gardening Magazine. 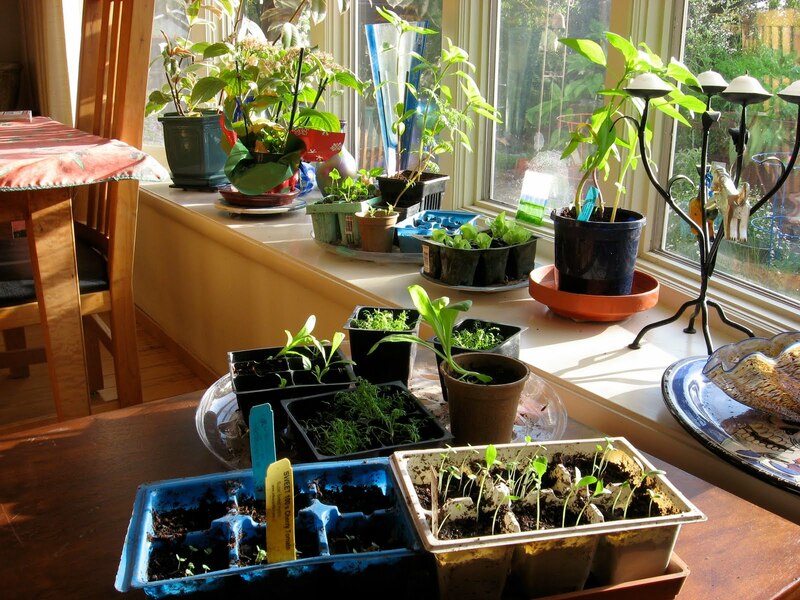 It has lots of tips and how-to on seed collection and starting plants from seeds. Other seeds I tried were her "Baby Mesculin Salad- Paris Market Mix". We are salad fiends in my family, and my goal is to keep a supply of salad greens in the garden all year round. (I was amazed to find that lettuce and other greens are not damaged by frost, at least where I live.) 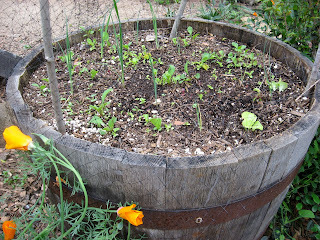 I sowed these directly outside in a barrel planter (covered with mesh to protect it from our bird neighbors). The seedlings have already come up. 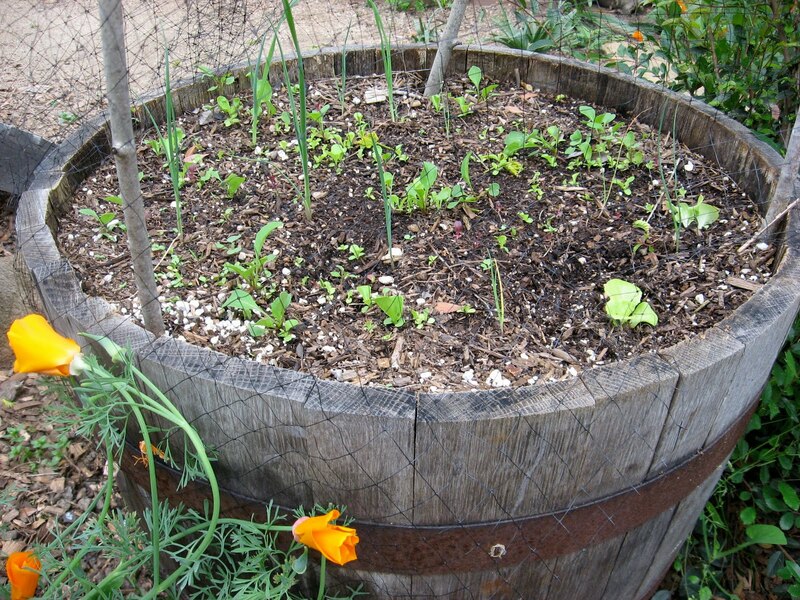 This barrel has been great for some added space to grow lettuce and other greens that prefer cool temperatures. It sits under our silk tree, so it has some shade on hot summer days, and sun in the winter when the tree drops it's leaves. 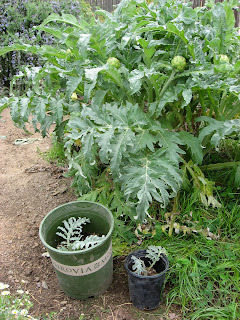 To keep up the early spring spirit, I recently started some divisions of our beloved globe artichoke. It is in it's second year, and is actually made up of about 3 to 4 plants now. It produces twice a year, in spring and fall, and yields a surprising amount of artichokes, (which I tend to buy weekly when they are available). 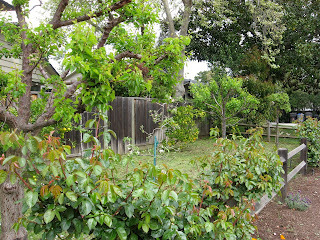 You can see my two starts in the picture below- one is for a friend, with whom we share plants and produce back and forth every year, and one is for my mother and sister's garden in Santa Cruz. which I have been wanting to introduce into my own front yard. 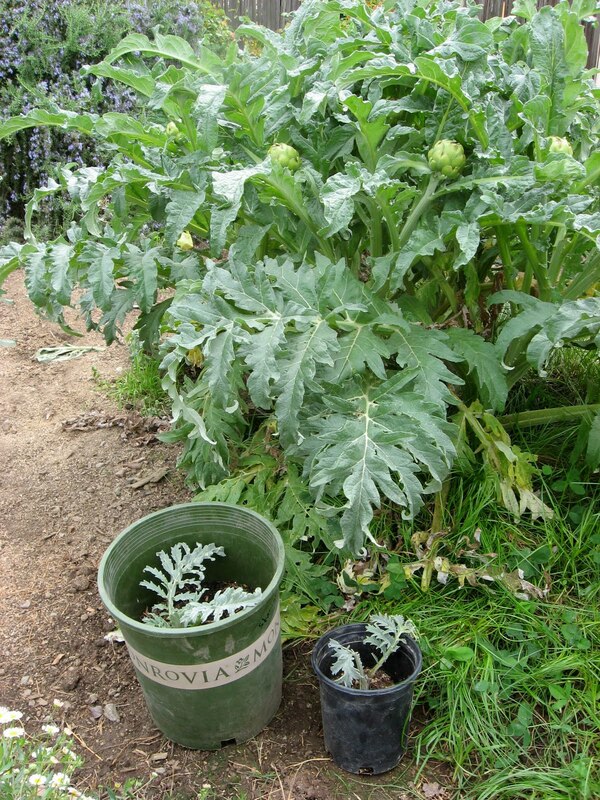 It attracts bees and it is said to be a beneficial companion plant, and may repel tomato worms (John Jeavons). The beautiful blue flowers are edible too. Since it self seeds easily, I didn't even want to spend money on a seed packet, so I asked our kind neighbors if I could take a small bunch from their garden. Of course they obliged right away, so I showed up with my spade and a bucket, and she grabbed a shovel and gave me a couple of big clumps (a liberty I was too shy to take in her garden!). 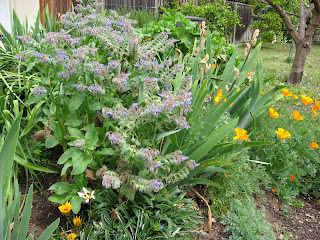 Here is a picture of her borage in full bloom below, looking lovely amid the irises and California poppies. 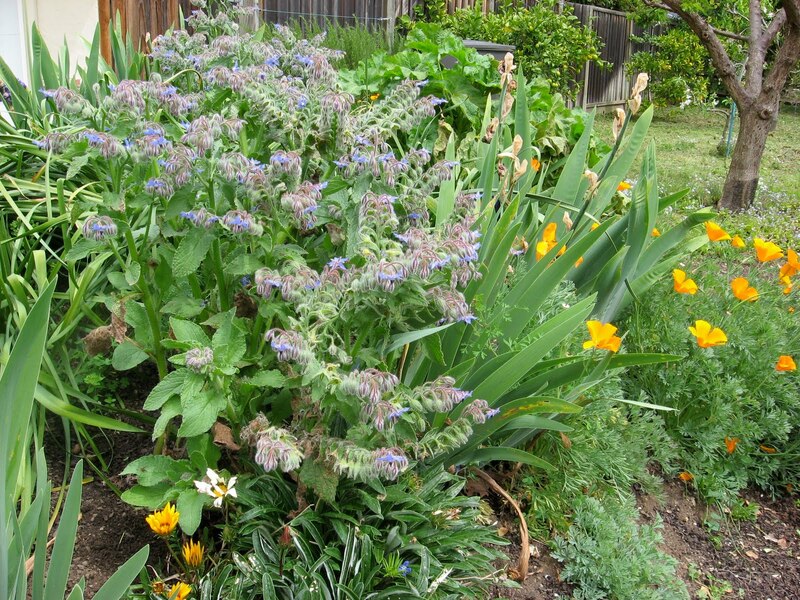 The borage is the plant with fuzzy looking stems and small star-like blue flowers. She told me that she had brought home another plant from her mother's garden, and the borage came as a tag-a-long and established itself in her garden. We got to chatting and she ended up giving me a dozen eggs from her family's ranch in Monterey, where her family has lived for 150 years. It was wonderful to share our love of plants and passion for gardening.